An Interview With Coach Jeff Gaudette - Running Tips Galore! RB5: An Interview With Coach Jeff Gaudette – Running Tips Galore! This episode is jam packed full of running tips! 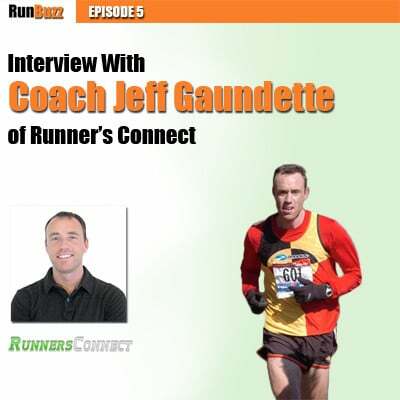 Today, I chat with coach Jeff Gaudette of Runners Connect. We talk about his experience as a collegiate and professional runner and his transition into coaching. Jeff also shares some great running tips around strength training, easy vs. hard pacing, and more! How Jeff was cut from his high school basketball team by his coach so he could train for track and field. Jeff’s transition from high school track and field to a successful collegiate track and field athlete at Brown University. Jeff’s experience training as a professional athlete with the Hanson-Brooks development team. How and why Jeff started coaching. Core training principles and the importance of strength training. Why runs longer than 3 hours are not necessary for all runners and how they may be contributing to your injuries. Why every training run should have a purpose. Why Jeff bases his training philosophy around the Hanson running method. How the training of advanced athletes is really not much different than the training of beginner runners. Meb Keflezighi’s Boston win and the importance of recovery. Why easy days need to be easier than you think. Jeff’s most critical training component, regardless of what distance you’re training for. How to optimize your aerobic system by training at the correct pace. How to slow down your pace without losing your running form. How improving your strength in your hips and glutes can help prevent injuries. How strength training can improve your running performance. How to incorporate strength training into your schedule.